Hey everyone! Travis here with an update for ECO.lution 2009 that many of you will want to hear. New this year, they are doing Faces of the Community by artists Pavel and Jessie Stehlik. More than simply a fun and unique way to raise money for a worthwhile cause, “FACES of the COMMUNITY” gives something useful back to the giver: a professional headshot with a shared copyright allowing the subject to use the headshot in whatever manner they see fit. In addition, with the story you share with the historian that meets with you the day of your photoshoot, you become part of Tampa’s history. If you have a business or idea to promote, it will be written alongside your photo and displayed in upcoming exhibits about the people that make Tampa the beautiful city that we are proud to call home. 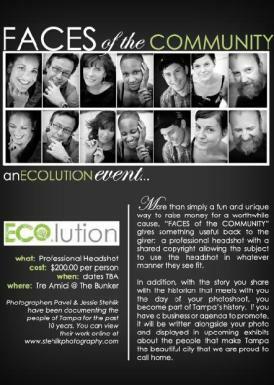 It costs $200.00 per person, but it&apos;s totally worth it, especially if you are in need of professional headshots! AND, the entire sitting fee will be donated to the Urban Charrette. The dates are still TBA, but it will take palce at Tre Amici @ The Bunker, 1907 19th St. N. Ybor City. So, stay tuned...as soon as we have the dates, we&apos;ll let you know. And as always, keep checking back for more updates about these events, and other great things to do in Tampa Bay!